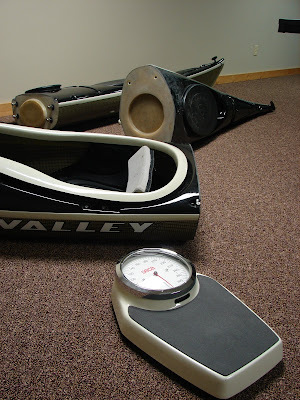 Weight is a crucial consideration with any boat. While a sectional can be assembled at water’s edge, thereby carrying only the components and not the entire boat, there are times when the whole boat will be preassembled and ready for a lug to the water. Furthermore, although it is said that “once in the water, all boats are similar”, this is not true from a physics standpoint. To create inertia, and forward motion, a heavier object requires more force than a lighter object. An honest testing of the weight of my take-apart Valley Aquanuat 3-piece LV ensues. This was performed in my basement, with the pieces scattershot like giant Legos around a heavy duty and accurate Seca spring scale. The boat is a Valley Premium layup, which is a carbon Kevlar vacuum-bagged hull, and a fiberglass deck. It has no compass or built-in pump, but has the stock Valley seat, dry hatch covers and skeg. I have left in all nuts and bolts. This is the weight ready to launch. A drumroll please. The Midsection with Cockpit 30.5 lbs. A backbreaking 72 lbs, all told, and that's with the Premium carb Kev hull ($500 option). For the record, you can see that each individual piece is, by itself, light. 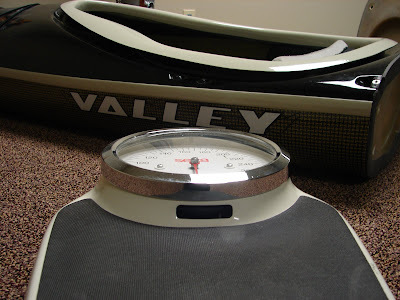 And it is my opinion that the one-piece fiberglass (not carb Kev) Valley’s on their website –listed without hatch covers at an impressive 49-53 lbs depending on the model—are very unlikely to be those weights in reality with hatch covers and water ready, as I have tested this AqLV Premium layup. The compromise to a sectional boat is, unquestionably, the weight.